The Round Lake Area Exchange Club Hometown Hero Committee is proud to announce U.S. Marine Staff Sergeant Janet Marrufo as their July hero. This month’s sponsor is Avon Township. Marrufo is a 2003 Round Lake High School graduate, she was registered at the Clubs site, www.rlaexchange.org/hero, by her sister Raquel Guevara of Round Lake Beach. 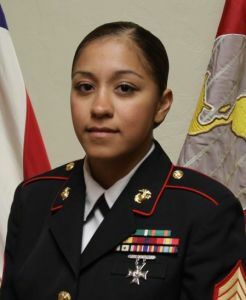 Marrufo currently serves as a Marine recruiter in San Diego. She was deployed for 6 months in Iraq in 2007. In additions to many certificates of appreciation she has received the Combat Action Ribbon, Global War on Terrorism Medal, Sea Service Deployment Ribbon, Marine Corps Good Conduct Medal and many other awards. She is a big fan of Round Lake Beach’s Orlando’s Pizza. According to Hometown Hero Project Chair, Sherr Ridge, the Staff Sergeant’s “Hanging with the Heroes” care package will be filled with chocolate and many sweets, a personalized “Hanging with the Heroes” t-shirt and letters from Round Lake Area School District 116 students. “We’d love to send her a pizza from Orlando’s but not sure how we could do that,” said Ridge. The Club will present a plaque on behalf of the July Hometown Hero to her family at their meeting on July 13. The meeting is held at Panera Bread in Round Lake Beach, 7:30 a.m.